So many local history books, while meticulously researched and factually indisputable are written in such a way as to be of interest only to history scholars. David Hughes' new book The Maldonians, however, does not fall into this category. This book is written with wit, pace and a breadth of detail so strong that the people described come to life as three-dimensional characters, as if in a novel. The book uses as its main source the defunct local newspaper The Maldon Express and covers the period between 1872 and the outbreak of the First World War. Among the characters we meet are Sir Claude Champion de Crespigny, renowned for horse-whipping members of the Salvation Army and boxing his servants! The book includes many events which shaped the town, from the great fire of 1892 to the opening of the railway line to Wickford to the celebrations of the Relief of Mafeking. The author, a highly regarded folk singer, performed extracts of the book to the Maldon Society, with help from actor Stuart Rayner. Readers of the book will undoubtedly wish they had attended these two readings. 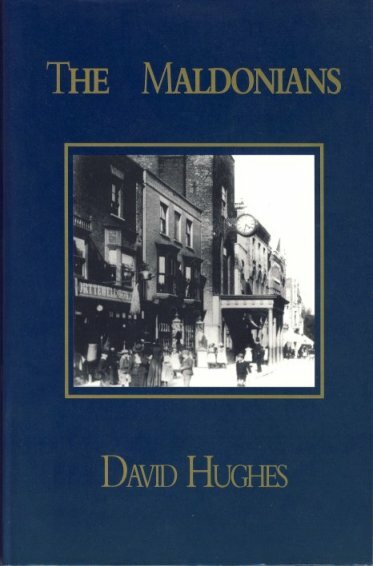 David Hughes' long-awaited book The Maldonians - Voices of Maldon 1872-1914 needs little introduction to anyone who has enjoyed one of the pre-publication dramatized readings arranged by the Maldon Society and others. The voices are those recorded in the Maldon Express the local newspaper of the time and in contemporary diaries and journals which paint a remarkable portrait of the town from the heyday of its Victorian prosperity to the outbreak of the First World War. National and local events provide a framework for speeches by prominent citizens which were reported at respectful length by the local 'rag'. Subjects ranged widely through the fields of commercial endeavour, education, recreation, and the emerging desire in some quarters to promote Maldon as a tourist centre, and through it all runs that perennially important theme, the town drains, which as Mr Hughes sagely remarks can be used as a bench-mark and barometer of any town's progress. Anyone with the slightest interest in Maldon will be fascinated by the extracts, not least for the indelible impression they offer that nothing very much has actually changed, least of all human nature or the operation of local government! Through the pages run a colourful cast of characters, councillors, clergy, doctors and businessmen, all pillars of the community, whose activities and ambitions were watched with suspicion by local ratepayers. Their appearances in print are interwoven with the saltier sentiments of fishermen, boatbuilders, vagrants, and such unfortunates as found themselves from time to time appearing before the local magistrates. Here be human life, in all its manifold variety. Mr Hughes has spent some 10 years researching his material, but has given it enormously added value from the way in which he has woven his cuttings into an immensely readable story, seasoned with wit and humanity and a sharp eye for the idiosyncratic. The book is illustrated with numerous black and white reproductions of postcards and contemporary photographs. It is enhanced by a comprehensive index and bibliographical references, and dedicated to the author's parents and long-standing Maldonians, the former Mayor and Mayoress Jerry and Muriel Hughes.